English, Phiip and Mary. AD 1554 to 1558. Silver groat. Denomination : Silver Groat (4 pence). Mint : London. Date : Initial mark "lis" used through the period of 1554 to 1558. Size : 22.4 x 23.3 mm. Weight : 2.01 grams (full weight for the issue). 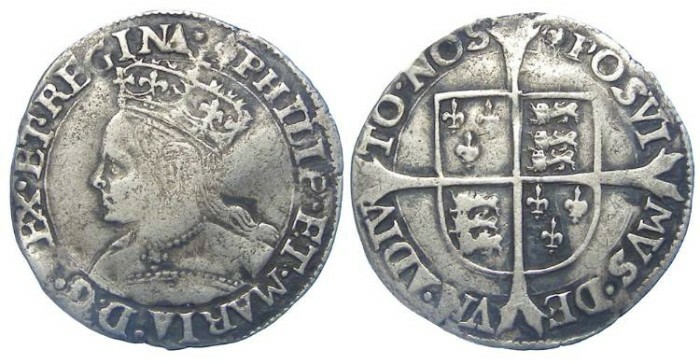 Obverse : Head of Mary left, with PHILIP ET MARIA D G REX ET REGINA around. Reverse : Long cross over a shield, with POSIMVS DEVM ADIVTO NOS (Latin for I HAVE MADE GOD MY HELPER).